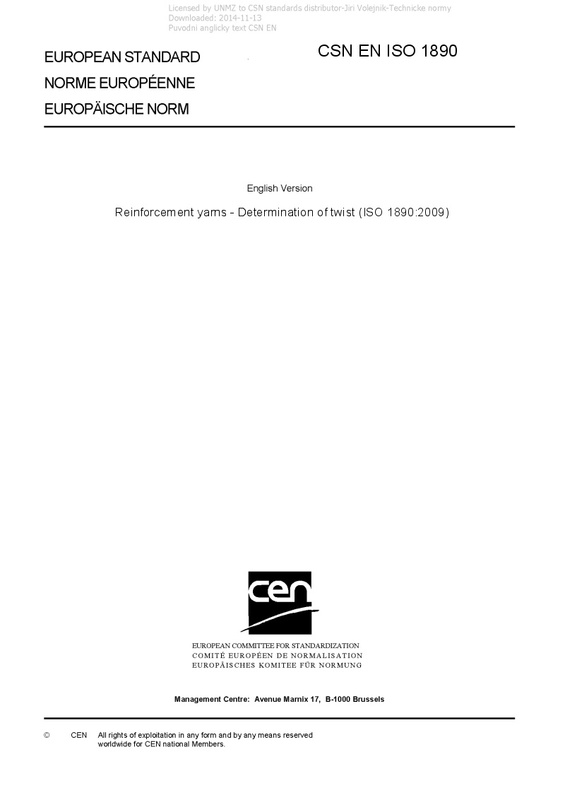 EN ISO 1890 Reinforcement yarns - Determination of twist (ISO 1890:2009) - ISO 1890:2009 specifies a method for the determination of twist in yarns made from textile glass, carbon, aramid or any other reinforcement fibres. The method applies to single yarns (one twist) and to folded or cabled yarns (two or more twists). For folded and cabled yarns, the method is generally applied only to the final twist step. The International Standard is applicable to package-wound yarns. If the measurement is carried out on yarns taken from a beam (or warp) or from a fabric, the result is of an indicative nature only. The method is not applicable to products made from staple fibres.